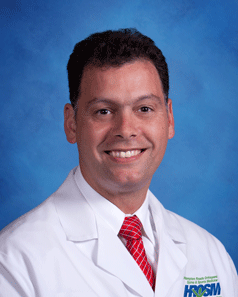 Adrian T. Baddar, MD, F.A.A.O.S. Dr. Adrian Baddar was the first fellowship trained hip and knee replacement specialist on the Peninsula. He was one of the first in the area to offer hip resurfacing and custom-fit knee replacements. Dr. Baddar specializes in a variety of surgical techniques including anterior, posterior, and anterolateral approaches to the hip. His practice includes minimally invasive joint replacement surgery, complex joint revisions, sports medicine, arthroscopy, and general orthopaedics. He regularly talks on pertinent orthopaedic issues in the community. Dr. Baddar is a fellow of the American Academy of Orthopaedic Surgeons and is Board Certified in Orthopaedic Surgery. He completed a fellowship in Adult Reconstructive Surgery at the prestigious Cleveland Clinic. He attended the University of Virginia for both medical school and orthopaedic residency. He was born and raised in Virginia and has been living in the Hampton Roads area since 2004. In addition to his practice with HROSM, Dr. Baddar provides our veterans with orthopaedic care at the Hampton Veterans Administration. Dr. Baddar currently serves as the Medical Director for HROSM’s Multi-Positional MRI Center as well as Workers’ Compensation. Dr. Baddar enjoys outdoor sports and is an avid runner. He is married with three children and currently resides in Newport News, Virginia. How Can I Tell If My Joint Pain is Arthritis?